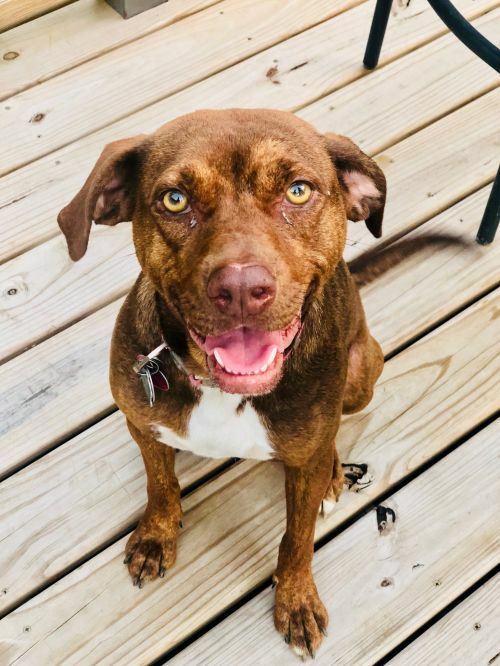 Alabama is a one year old lab mix who came to us from a shelter where she wasn't doing so well anymore. She wasn't getting the exercise and interaction she needed, and needed to get into a foster home. Alabama is one year old and weighs about 45 pounds. She originally came to Minnesota from another shelter/rescue in the south so this is her first time getting used to Minnesota temps and winter. She is doing well adjusting so far. Alabama is a young energetic dog that needs a family who will make sure she can get enough exercise to keep her happy - a fenced yard or active family would be great for her. Alabama does well with other dogs and likes to play. She has done great with people so far. All dogs will need a housetraining refresher when moving to a new house and new routine. 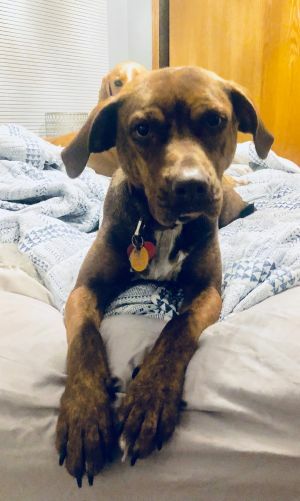 Alabama was previously treated for heartworm and it's important that she is kept on heartgard or another preventative for the rest of her life. This dog will not be at our adoption event at the Woodbury PetSmart on Saturday from 11-2, so contact her foster if you'd like to meet her.